Also known as: Sakamoto desu ga? I expect the manga's better. We have that on our bookshelves and Tomoko says it's good, although she also says that at only four volumes it's exactly the right length. The series has no plot and very little emotional depth. 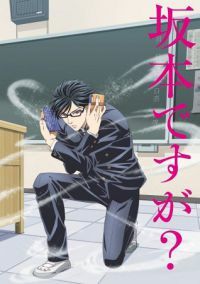 It's a gag series about a super-cool schoolboy called Sakamoto and the whole world being obsessed with him. Firstly, Sakamoto. He's slender, aloof, has beautiful manners and does goofy things that made Natsuki laugh out loud when he saw me watching this anime. He's not so much a character as a Awesome Reaction Generator. I wouldn't really even call him the protagonist. The manga's author is female and this isn't a wish-fulfilment series, but instead more like a parody of what happens when manga tries to portray cool characters. Pull his chair out from under him? He'll sit in mid-air. Shove a dust cart into his legs? He'll ride it down the corridor like a chariot. Try to beat him to a bloody pulp on-stage in front of the whole school? He'll turn it into part of his school presentation. He never has fist fights (not even to beat up bullies), he loves all living creatures and his career goal is to join NASA and help mankind colonise Mars. All the girls in his class are obsessed with him, as indeed are some of the boys. He has enemies, because they're jealous, but attempts to bully him are always foiled by his awesomeness and his would-be tormentors learn to become better people. Almost everything he says or does will make everyone gasp as the camera worships him, with sparkles. Sometimes he'll be doing something childish (e.g. playing in the snow in ep.11), but of course he'll find a way to make even this amazing. This is... sort of amusing, sometimes. I watched it all. It's not unfunny, but I did prefer the rare occasions on which the series decides to create a supporting character with emotional depth. Megumi Fujita in ep.6 is Sakamoto's stalker, taking photos of him when he's not looking. Then, one day, she sees that he's being haunted by a J-horror ghost. What should she do? This turns into a meaningful story. It's good. I liked that episode. There are two regrettable voices. Akira Ishida occasionally veers into the dreaded Fat Voice when doing Yoshinobu Kubota, which is always a mistake and I can't think why the anime industry keeps doing it. (The Fat Voice has nothing to do with what fat people actually sound like, but instead is produced by the voice actor over-inflating their diaphragm.) He's an important character, too. Much more peripheral (fortunately) is Erika, who's a schoolgirl as tall as the boys and hence is being given a variant of the Fat Voice by Mikako Takahashi. That was annoying. It's okay, but there's not really a lot to talk about here. Atsushi's man-crush on Sakamoto is being played surprisingly straight, since he likes to think of himself as a hardened delinquent. It's funny, but he's also quite messed-up. There's an out-and-out villain in the later episodes. The anime cliche of all the girls fancying a single personality-free boy is unusually being written from a female perspective (albeit a comedic one) and undercut in all kinds of ways, almost to the point of semi-tragedy when it comes to Kubota's mother. I didn't love this series (and I ended up fast-forwarding through the OVA), but I watched it all and I might easily end up reading the manga. It's only four volumes. I'm mildly interested in seeing whether or not I'm right about the manga being better.